Nickel Metal Hydride or NiMH batteries are considered better than NiCad batteries as they are less likely to exhibit the “memory” effect, have a higher storage capacity (+25%), and there is no toxic cadmium to dispose of when they finally wear out. NiMH batteries last an average 6,000 hours and can keep 80% of their charge at -20°. 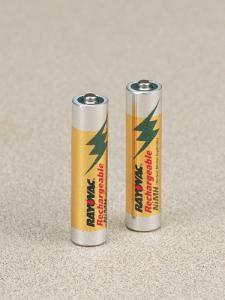 You can also recharge these AA and AAA batteries with the charger, available separately.